Evergreen Memorial Park, Hobart, Indiana, U.S.
James Johnson Edwards (March 6, 1918 – January 4, 1970) was an American actor in films and television. His most famous role was as Private Peter Moss in the 1949 film Home of the Brave, in which he portrayed an African American soldier experiencing racial prejudice while serving in the South Pacific during World War II. Edwards majored in psychology at Knoxville College in Tennessee and continued his education at Northwestern University where he received a master's degree in drama. While enrolled at Northwestern, he participated in student productions and in the Federal Theatre Project. During World War II he was commissioned as a first lieutenant in the U.S. Army. After the war he appeared on the New York stage when he assumed the role of the war hero in the touring play Deep Are the Roots. 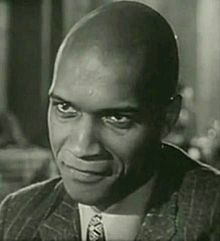 Throughout his early and mid acting career, Edwards portrayed African American soldiers, playing such characters in Home of the Brave (1949), The Steel Helmet (1951), Bright Victory (1951), Battle Hymn (1957), Men in War (1957), Blood and Steel (1959), and Pork Chop Hill (1959) as well as an uncredited Messman in The Caine Mutiny. (1954). It was believed he was originally cast in Universal's Red Ball Express but was replaced by Sidney Poitier when he refused to testify before the House Un-American Activities Committee. Other notable roles were in Stanley Kubrick's The Killing (1956) and John Frankenheimer's The Manchurian Candidate (1962). Edwards was prolific on TV in the 1960s, playing character roles in various series such as Peter Gunn, The Fugitive, Burke's Law, Dr. Kildare and Mannix, before his death of a heart attack at the age of 51 in 1970. One of his final roles was as General George S. Patton's longtime personal valet, Sergeant Major William George Meeks, in the film Patton. Wikimedia Commons has media related to James Edwards (actor). This page was last edited on 8 January 2019, at 22:16 (UTC).